Provide comfort for the family of Don Stephens with a meaningful gesture of sympathy. 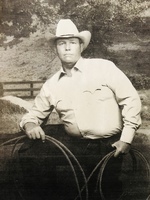 Don Stephens, 75, of Andrews, passed away on Wednesday, March 20, 2019 in Odessa, Texas. Family and friends will gather to celebrate his life at 10:00 AM Saturday, March 23, 2019 at the McNett Funeral Home Chapel with Pastor Brant O’Connor officiating. Cremation is under the personal care of McNett Funeral Home. Please celebrate his life by visiting www.mcnettfuneralhome.com. Don was preceded in death by his parents, two brothers, Kenny and Gayland Stephens. He is survived by his wife Peggy of Andrews, two daughters, Amanda Alberts of Andrews, Stacy Moore of Andrews; four grandchildren, Stephen Alberts and wife Jade, Megan Nelson and husband Jonathan, Kade and Zane Moore. To send flowers in memory of Don Stephens, please visit our Heartfelt Sympathies Store. We encourage you to share your most beloved memories of Don Stephens here, so that the family and other loved ones can always see it. You can upload cherished photographs, or share your favorite stories, and can even comment on those shared by others. James and Jennifer Nusz sent flowers to the family of Don Stephens. Donnie was a very special person and will leave a hole not soon filled. Our sincerest condolences for your lose. James and Jennifer Nusz purchased the Summer's Light Bouquet for the family of Don Stephens.